The National Audit Office Report into the demise of the charity Kids Company makes for sombre reading. The report paints the picture of an organisation that was good at persuading people (especially ministers) to fund it, but which lacked leadership, focus and control when it came to actually providing services. I have to say that it has made me reflect, because my first reaction to the charity's closure was to suspect that it had become too outspoken, not too disorganised. But now it is clear what has happened, and why, it is also clear that the moral of this unhappy saga for the future of child protection services is not being trumpeted loudly enough. Let me explain why. Camila Batmanghelidjh, the former chief executive of Kids Company, is reported to have been an advocate of outsourcing child protection work from local authorities to the voluntary sector. Ministers, of course, are at this very moment working on such plans, albeit involving some private sector involvement as well. The charity's demise is clear evidence just how dangerous such a strategy is. The biggest obstacle to getting third party providers to deliver complex services to children and families, to meet complex needs, is that complex services are notoriously difficult to specify; and contracts to supply them are notoriously difficult to monitor and enforce. Add to this potent mix the fact that child protection services are safety critical and the potential for serious, and possibly tragic, service failures has to be recognised as being very high indeed. In short, in the wake of the Kids Company collapse, ministers need to recognise the real dangers to services, and to service users, of an arms-length outsourcing approach. Armed with the lessons of recent history, and informed by this National Audit Office Report, ministers would indeed be reckless to proceed with further outsourcing of children’s services without a great deal of further thought and reflection. From the standpoint of their political careers, and the best interests of children and young people, they would do best to quietly drop the whole outsourcing strategy and to concentrate on less risky and better-evidenced approaches to improvement. And the Prime Minister himself, who was a fan of Kids Company, would do well to reflect on the errors of judgement implicit in continuing to fund the charity when there appeared to be ample evidence that something was amiss. In particular he needs to recognise the implications for the whole outsourcing debate. Should individual social workers be graded as part of Ofsted inspections? More than half of children who are looked after in Britain are looked after because of abuse and neglect. Statistics for England recently published show a steady and persistent increase in their numbers since 2011. 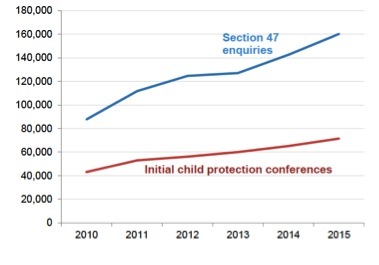 Like other recently published child protection statistics for England, the trend is in one direction only – up. 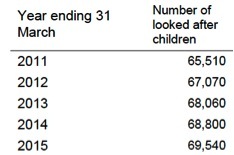 There are two nice clear graphs in the latest statistics concerning the characteristics of children in need in England for the period end of March 2014 to end of March 2015. 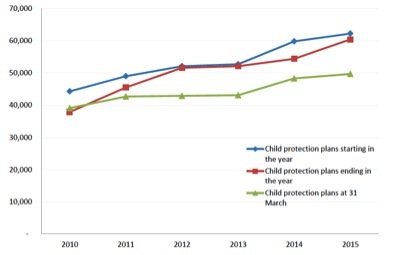 Both show unremitting increases in child protection work. The first concerns the number of Section 47 enquiries undertaken (a Section 47 enquiry is carried out when the local authority has reasonable cause to suspect that a child is suffering, or is likely to suffer, significant harm). The number continues to rise with just over 160,000 Section 47 enquiries undertaken in the year ending 31st March 2015 – an increase of 12% on the previous year. During the same period there were just over 71,000 initial child protection conferences, nearly a 10% increase on the previous year. 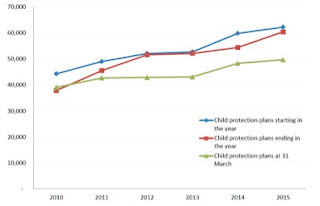 The second graph concerns the number of children made subject to a child protection plan. In 2014 - 2015, 62,200 children became the subject of a child protection plan compared to 59,800 in the previous year, an increase of 4%. What the statistics do not show is what resources are going into dealing with all this increased work. I expect that the Government don’t want to tell us about that, but I think they ought to. Have resources in real terms gone up by 30%-40% since 2010? I doubt it. It is clear that at the heart of the failure to protect seventeen year-old Georgia Williams from Jamie Reynolds, who murdered her by hanging her, there is a catalogue of poor decision-making. Reynolds was treated as low risk when in fact there was plenty of information available to the main agencies dealing with him, especially the police, to indicate that he posed a high risk, not just to Georigia but to other young women as well. But, for reasons that still remain unclear, it was decided only to caution him for a similar previous offence, leaving him at large and unsupervised at the time of his attack on Georgia. And it was decided not to warn some of those whose images he had in his position and which he had doctored in an alarming way. In addition to a Serious Case Review report there is also said to be a report by the Devon and Cornwall police force into the handling of the case by West Mercia police. This has not so far been released to the public, although it has apparently been shown to some journalists. I found the Serious Case Review report hard going. It seemed to be endless detail and not much analysis. There seemed to be more references to poor ‘information sharing’ than to poor ‘decision-making’. Perhaps that was what sparked off the memorable radio interview on the Today programme on Radio 4 this morning where a representative of the Police Superintendents’ Association stuck rigidly to his contention that poor information sharing was to blame, while the incredulous interviewer kept pointing out that the police were in possession of all the crucial information at the time it was decided to treat Reynolds as low risk. I regret to say that the phrase ‘poor information sharing’ has become on a par with the mantra of ‘lessons will be learned’ when it comes to reflecting on this kind of tragedy. It seems to be wheeled out as a general-purpose explanation and goes hand-in-hand with a general-purpose solution – everybody promises to share more information next time. The consequence that professionals and practitioners are in danger of information overload, and likely to become unable to see the wood because of the trees, appears to be recognised by few. I would like to see attention in this and similar cases focused on the question of why poor decisions were made. I don’t want to focus on blaming those who made them, because I expect that they were made professionally and in good faith; despite the fact that they turned out to be tragically wrong. But there are well known ‘error traps’ facing decision-makers that are listed in the human factors literature, including jumping to solutions, being unwilling to challenge those seen as ‘experts’, assuming that there is insufficient time to make a full assessment, failing to consult other people and, probably most importantly, failure to review a decision and amend it if necessary . Major areas of difficulty can arise where groups are involved in making joint decisions. Of particular importance are risky shift  and groupthink  in which groups have been seen to take riskier decisions than would individually be taken by each of their members. Groupthink is often credited with being a significant factor in the Bay of Pigs fiasco in 1961. Safer decision-making practice comes from being aware of these error-traps, of being able to recognise them and in knowing how and when to take action to avoid them. Over the years I have probably had more contact with the upper echelons of the British civil service than most people. In a variety of contexts I have had to deal with civil servants in the Home Office, the Department of Health and the Department for Education. I was therefore very interested to read an article in the Independent that speaks of a ‘snake pit’ and ‘poisonous’ culture in the civil service that rejects outsiders. Apparently a report prepared for Government has found that senior officials are resistant to change and care more about process than results. Civil service structures are described as ‘unnecessarily hierarchical’. Sadly I have to say that this reflects much of my experience of trying to persuade officials to consider various ways of improving child protection. Recent attempts by groups I work with to get some discussion of simple and cost effective ways of making practice safer through better understanding of how mistakes happen, and how a human factors perspective can help reduce and mitigate error, have fallen on what may only be called stony ground. A common response I have received involves endless, torturous, but ultimately fallacious, arguments against change and innovation combined with high-sounding statements that something similar is already being done, even when it manifestly is not. The impression I gained was that I was dealing with a small group of people whose jobs consist solely of finding reasons for doing nothing. I was recently involved in preparing one paper arguing that Serious Case Reviews are poor guides to learning from mistakes and proposing a more promising alternative – critical incident reporting. After a long correspondence we were eventually assured that the problems we raised were already being dealt with – by Serious Case Reviews! We despaired. I am glad to see that the NSPCC continues to reveal the considerable shortfalls in the mental health services provided to abused and neglected children. The NSPCC has collated figures from 35 mental health trusts in England and estimates that about 1 in 6 of abused and neglected children referred for therapeutic services is rejected. The NSPCC’s chief executive, Peter Wanless, is absolutely correct in saying that children, who do not receive the right kind of help and support following abuse or neglect at the right time, will be more likely to suffer lifelong damage such as post-traumatic stress disorder, depression or risk of suicide. Penny-pinching on child and adolescent mental health services is a false economy. If children and young people receive the right kind of help at the right time, they will be less likely to require long-term mental health services as adults. They will be likely to be healthier and be more active participants in society throughout their lives. We all want to make child protection safer. In thinking how to do this, a useful distinction can be made between technical and non-technical skills. Technical skills are specific to the particular skills sets of various professional groups involved in child protection work. For example paediatricians can acquire better skills in the medical diagnosis of child abuse and neglect through clinical research and education. Police officers might learn better ways of conducting interviews with the victims of abuse and neglect or with perpetrators. Social workers might learn new techniques for listening to children and young people, identifying their needs and providing care to help them. Child psychologists and child psychiatrists might learning new therapeutic approaches to helping abused and neglected children. Technical skills are based on professional learning and knowledge. They are acquired through professional training and development. Non-technical skills, on the other hand, are those skills that we all must have to work safely. These include being aware of situations, making decisions, communicating with others, responding appropriately to authority and hierarchy, working in or leading a team and recognising and managing stress and fatigue. These skills are common to all professional groups and are grounded in the psychology of human error, not in any particular body of professional knowledge. It follows that they can be learned in multi-occupational and multi-professional groups and that they can be taught without a particular requirement for previous professional experience, education or training. Non-technical skills are sometimes referred to as human factors. Experience in a range of safety critical industries suggests that the journey to acquiring much more highly developed non-technical skills can begin with a short course focused on learning and improvement. There is a sizeable literature on non-technical skills (or ‘human factors’ if you prefer). An introductory guide entitled Safety at the Sharp End is written by Flin, R. O’Connor, P and Crichton, M. It was published by Ashgate in 2008. There is more straight talking in reports of a debate also taking place in Canada. Steve Gaetz of the Canadian Observatory on Homelessness is reported to have told a meeting in St. John’s, Newfoundland and Labrador, that there is a strong link between the lack of support for young people leaving care and youth homelessness. Gaetz said that his research in Toronto had revealed that more than 40% of homeless young people come from foster care or group homes. He argues that while more than 40% of Canadians in their 20s still live with their parents, young people are required to leave care at 18 with ‘Happy birthday. Here’s a card. Here’s all your clothes in a bag.’ That, he says, is setting these young people up to fail. He is perfectly right to argue that care leavers need to be funded until their mid twenties. And it is basic commonsense to say, as he does, that although to do so will cost money, it is an investment that will pay off. Not to do so risks creating a group of homeless young people who cannot be competitive in the labour market. There is something refreshingly logical in the debate in the Canadian province of British Columbia about the safety of the child protection system there. The focus is on the question of whether there are enough people employed to provide a safe service, with at least one influential report concluding that there is a very significant shortfall. It seems to me that any review of the safety of a child protection service should begin by addressing the question of whether sufficient people are employed to deal with the volume of work. But that is a question that rarely seems to be addressed in any analytic detail in Ofsted reports in England, which seldom, if ever, provide detailed analysis of how many people are dealing with the work.